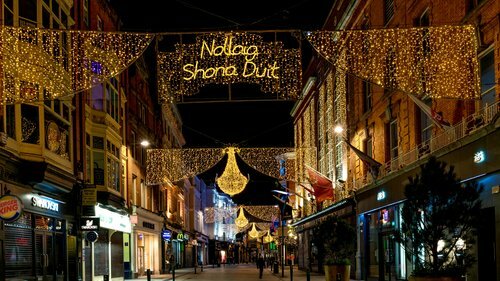 Christmas 2018 – In this article Shane Adlum tells us what events are happening around the city of Dublin this Christmas time! It’s that time of year again. The tree is dragged out of the attic, the stockings are hung with care, you send cards to people you haven’t seen in years and you’re torn between sitting in by a warm fire and being social and braving the cold. Here are just a few ideas that might make you don the hat and scarf and get outside. For some the best part of Christmas shopping is heading to the Christmas markets, the smell of freshly cooked burgers, the stalls selling every sweet imaginable and the excuse to have a cheeky mulled wine. The Dublin Flea Christmas market is on at the Point Square and will be run over two long weekends, December 6th to 9th and 13th to 16th. It offers a unique take on the traditional market with an array of different stalls each weekend and a wide selection of items for sale. For a more local feel why not visit St James’s Christmas craft fare, located in the parochial hall next to St James’s church. There’ll be a fun festive atmosphere and a range of gifts are available for everyone. This weekend, December 1st and 2nd, is the final weekend of the fare, it’s on from 11am to 6pm, so don’t miss out. The Bernard Shaw Xmas flea also takes place this Sunday, stating at noon, and is located on South Richmond Street. Christ church is one of the most scenic places to be over the Christmas period and there are a lot of events on, so there are plenty of excuses to get down there. On December the 8th the Park Singers bring “joy to the world” as they sing a collection of carols from around the globe. New Dublin Voices bring their “carols for Christmas” to Christ church on December 15th, which promises to be a great night of song. Then on the 22nd of December, Mornington Singers and conductor Orla Flanagan will be creating a fantastically festive atmosphere as they return for their annual concert. Vicar Street is jam packed with gigs over the festive period. Christy Moore is playing a slew of shows with extra dates being added due to popular demand. He plays Vicar Street December 10th, 11th, 17th, 18th and January 2nd, 3rd, 8th, 9th, 14th and 15th. Damien Dempsey is playing four nights at the venue while the charismatic Glen Hansard plays two. Funny man Tommy Tiernan will do a run of shows in January and February, which will help alleviate those post Christmas blues. For full gig listings see the Vicar Street website. Glen Hansard has brought busking to new levels with his annual Christmas Eve performance in Dublin, normally on Grafton Street but moved to South Kings Street last year. Bono normally makes an appearance while others like Hozier, Damien Rice, the Coronas and The Script have all made appearances in the pasts. The now annual event raises money for charities helping the homeless. No information is yet known about this year’s event but keep an eye out on Glen Hansard’s twitter for further details. American actor Neil McGarry brings his one man show performance of the Dickens classic A Christmas Carol to the smock alley theatre on December 4th and 5th. This will be the shows first European performance and judging by the reviews, it’s not to be missed. There are a number of other events throughout Dublin over the festive period which promise to get you in the seasonal mood. Wild lights at Dublin zoo runs until January 6th, described as a must see event for the whole family and boasting a spectacular light display, it has become a very popular Christmas event. Winter Funderland, a Christmas tradition for many, returns to the RDS on St Stephens’s day until the 13th of January. There is also the usual array of pantos. For some it isn’t Christmas without a visit to the pantomime. Panto at the Gaiety dates all the way back to 1873 and this year’s show will be The Snow Queen, which will surely be spectacular. The Cheerios panto this year is Snow White and will be at the Tivoli theatre. Other pantos to keep an eye out for are Robin Hood at the Helix and The Olympia hosts Polly and the Magic Lamp. All of these promise family fun and a great night out.